Hollywood's fascination with the MCM aesthetic goes back to mid-century itself, when Hitchcock's 'North by Northwest' (above) came to the screen. An Eichler home in Granada Hills' Balboa Highlands (top) played a central role in the recent film 'Cake' that starred Jennifer Aniston. Center: Aniston with co-star Sam Worthington. 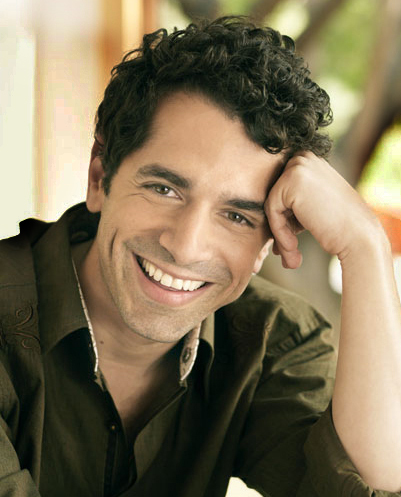 Above: 'Cake' director Daniel Barnz. 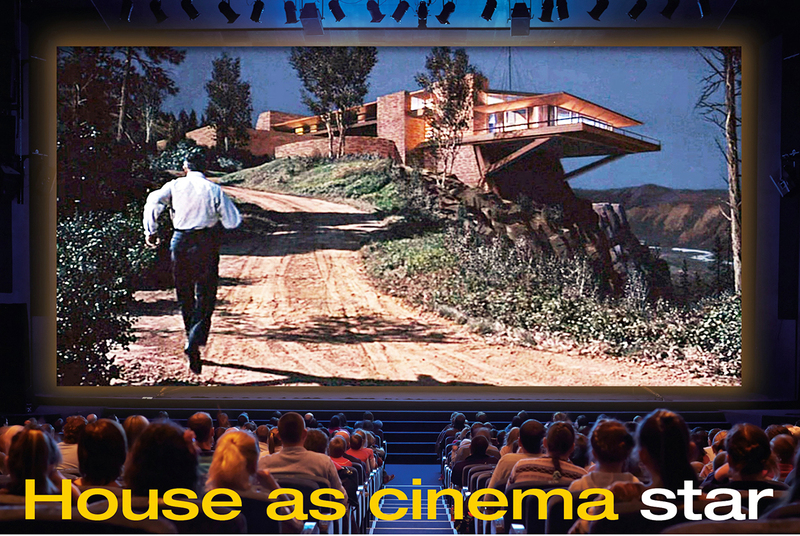 In their reviews, film critics rarely give special attention to domestic settings in movies unless they are something spectacular—a futuristic fantasy perhaps, or a living room with a waterfall tumbling through. Still, after the movie 'Cake' hit theaters two years ago, calls came into the filmmakers about the house that served as the setting for a dramatic tale about a woman consumed by pain and grief. It was an Eichler house, and the woman was played by Jennifer Aniston, the perky comedic actress who, nearly 20 years after her debut in the TV sitcom 'Friends,' had been judged by readers of Men's Health magazine to be "the sexiest woman of all time." Aniston, who was playing against type with 'Cake,' attracted much attention. But so did the house, which the New York Times critic called "a mid-century magazine layout of a house." "Its clean lines, drawn by an architect and embellished by a period-design obsessive, make a vivid contrast with the scars jaggedly slashed across [the Aniston character's] face and body," the critic wrote. "There has been a lot of reaction to the house, more so than in any other films I've done," says Daniel Barnz, the film's director. "People want to live in that home. People responded in that way." Sexiest house of all time, anyone? 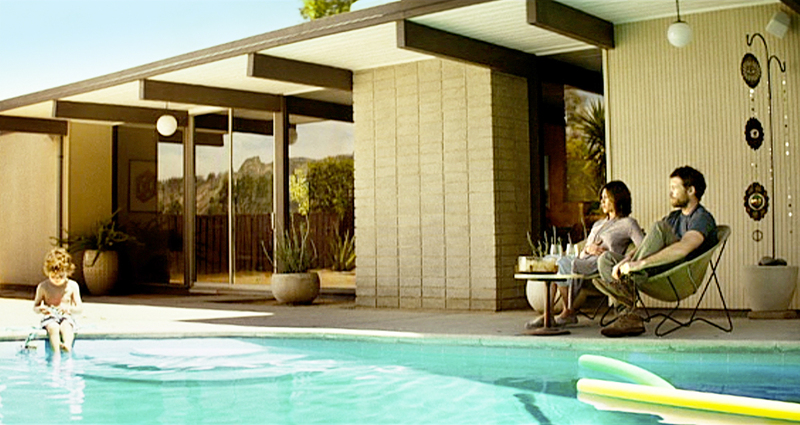 Eichlers and other mid-century modern homes have been popping up in movies, TV shows and commercials, and music videos ever since the mid-century. But with the growing awareness of mid-century modern in recent years, the homes seem to be in even greater use these days. For a Volkswagen TV spot, a grease-covered do-it-yourselfer changes his car's oil in the driveway of an Eichler. Another commercial shows an attractive couple rubbing car care product Mothers M-Tech polish sensuously into their car in front of their Eichler home. Another Eichler shows off its walls of glass in—what else?—an ad for Windex that features two talking crows who bedevil the home's owner to call attention to his dirty glass. In a commercial for Western Digital's cloud storage, a camera starts high in the clouds and descends to earth over an Eichler neighborhood. It approaches an Eichler home with a flaming-red door and scoots into the living room towards a couple relaxing, as the narrator queries, "Why not bring the cloud home?"